Larry's eMall - eShop With Your Mouse! L K - Larry's eMall time! Secure eShopping With Your Mouse! Welcome to Larry's eMall. For weeks we have been searching cyberspace to establish relationships with some of the finest eShops anywhere. All of the eShops in our eMall have high quality products and secure websites so you never have to be concerned about using your credit card in our eMall. You can use the pull-down menu or click on the banner of the eShop you wish to visit. To visit more eShops on another level, click on the number of the level you wish to visit near the bottom of this page. 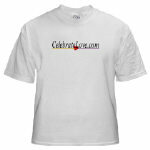 Larry's T-shirt e-Shop - This eShop features CelebrateLove.com t-shirts, sweatshirts, boxer shorts, mousepads, coffee cups, hats and more! Guiding Light Video - This eShop features Children's Christian videos, software and games all designed to teach good values.